The Walk of Words: F-boing-lar! When you read a name in a book that has an apostrophe in it, how do you pronounce it? Apparently Friday was International Apostrophe day! So celebrate your apostrophes (by using them correctly and/or mocking incorrect uses). Personally I don't mind apostrophes in fantasy/science fiction names if they have a purpose to be there (I rather like Anne McCaffrey's use of them; it's perfectly logical). On the other hand, I'm a bit irritated by random apostrophes that follow no rules whatsoever. 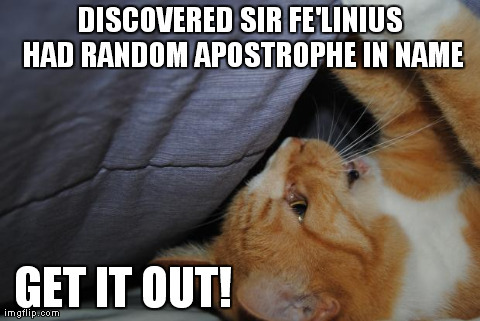 Here's an article on how apostrophes worked their way into many real, modern names, such as O'Brien, and the use of them in character names in stories. What's a comical misuse of an apostrophe you've seen recently? Ha-ha I get irritated with the use of apostrophes in names as well. Most times it serves absolutely no purpose! Unless like my little brother, your name is D'Anthony...because then it would be pronounced DAN-Thony, just wrong! Lol! Yes, I'm all for using apostrophes when they serve a real purpose, and showing how to pronounce a name is definitely a real use! I treat apostrophes in fantasy names like they're separating syllables that would otherwise get spliced. Kind of reminiscent of Baba Brinkman's explanation for why one of his songs is called "I'm a African" instead of the grammatically correct "I'm an African". But yeah, the random useless overuse is annoying. I like to pretend the apostrophes represent Bushman-type clicks in that case.